Ella's combination of performance and workflow brings your immunoassays to the next level. In just 90 minutes you get highly reproducible validated assay data with no manual steps. 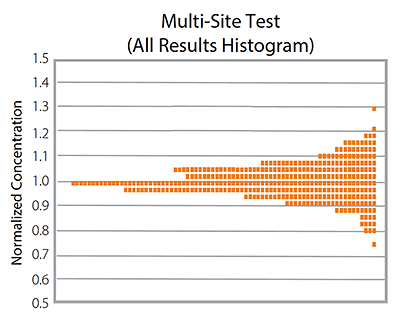 The assay performance behind that data includes sub-picogram level sensitivity, 4+ logs of dynamic range and reproducibility that rivals the best laboratory automation. 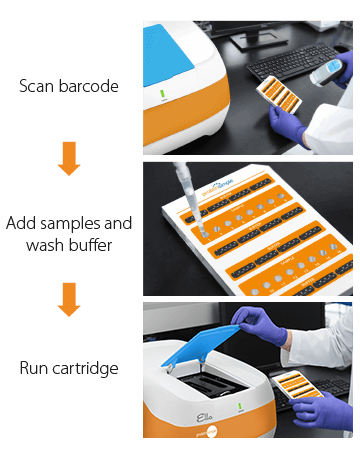 All in a compact package that doesn't break your budget or your lab bench. Ella does immunoassays in a microfluidic Simple Plex cartridge. It's like using a pre-kitted immunoassay, except everything's pre-loaded on the cartridge—even the calibration curve! All you need to do is add your sample and buffers and put the cartridge in Ella. 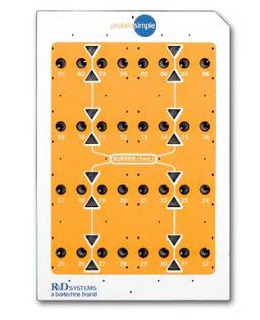 The immunoassay part works like this: sample runs through a microfluidic channel that binds your protein of interest. Next, Ella washes off unbound analyte and adds a detection reagent. 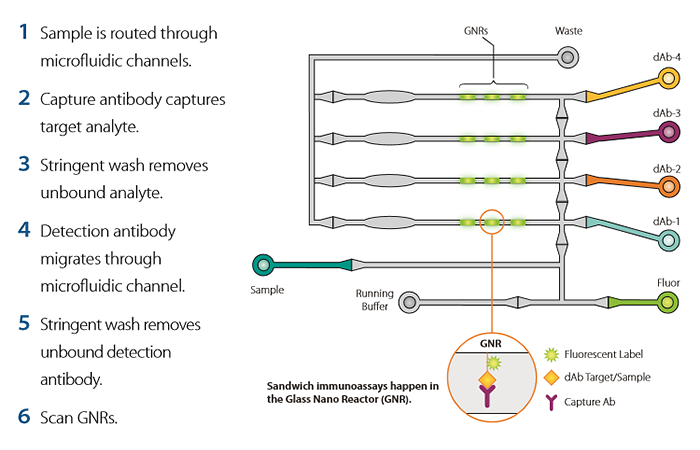 Because each channel has three Glass Nano Reactors (GNRs) coated with a capture antibody, you get triplicate answers for each sample. Answers are then generated from the factory-calibrated standard curve that comes with every cartridge. Sound familiar? It's the same immunoassay you're used to, just without the errors that come with traditional assays. You're in a race to make that next discovery, and Ella can help you get there faster. There's no need to split your time between running assays in the lab and analyzing answers at your desk. 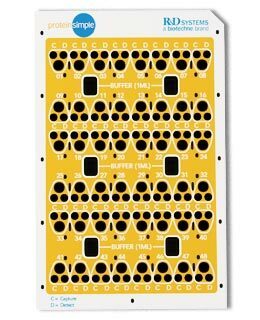 Simply add your sample and buffers to the Simple Plex cartridge, put it in Ella and start your run. There's only 10-15 minutes of hands-on assay prep time, and she gives you fully analyzed answers in an hour! 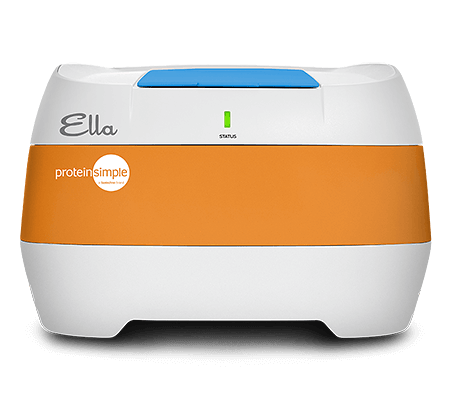 When it's time to develop and transfer your immunoassay to other labs, sites or a contract research organization, Ella makes it easy. Because Simple Plex assays are precisely controlled in the cartridge, there's no chance for pipetting errors. You'll get the same reproducible answers across multiple users and multiple sites. Simply put, you'll get consistent answers anywhere, by anyone on any Ella. Figure 2. Testing across 3 sites, 11 users and 9 Ella instruments. Four different assays were processed for CCL2, IL-6, TNF α and VEGF-A. 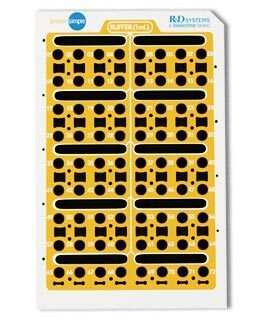 Eight unique serum samples with 2 controls for a total of 704 answers.